This family style home is open and welcoming with a gated front yard and porch. There is an enclosed backyard patio and garden with a pergola over the eating area for shade. Guests are welcome to use the large natural gas BBQ and eat outside at the table that can sit 4-6 people. Our main floor living space is kid friendly and has lots of toys available for your little ones to play with. There is a 50 inch flat screen television that has a Netflix, a Blu-ray player and cable. The eat-in kitchen has a small harvest table that can seat 6 comfortably. A new washer and dryer are also available right off the kitchen, as well there is a dishwasher, microwave, toaster and coffee maker. Upstairs is nice and bright with 2 bedrooms and an open concept den. The main bedroom has a queen bed, the second bedroom has a double bed and the den has a child bed bunk bed that sleeps one. We are a pet free and smoke free home. We LOVE our neighborhood and we know you will too! 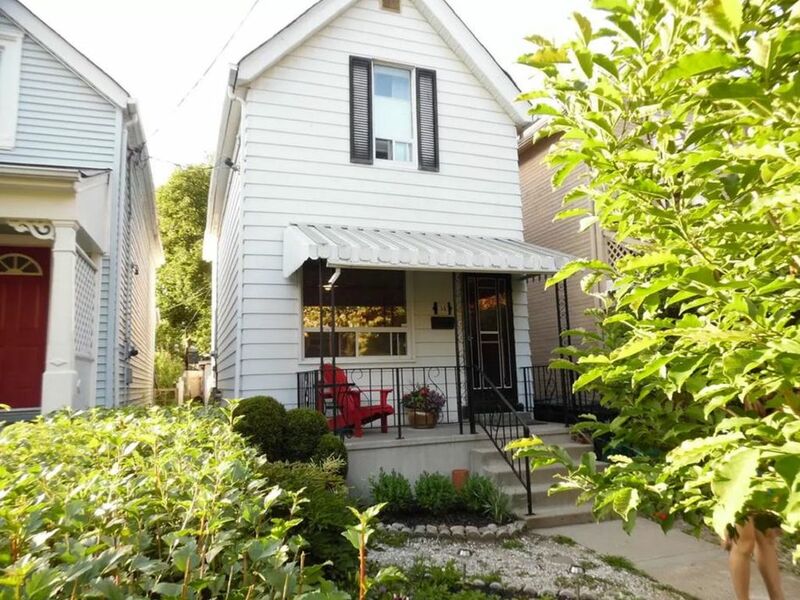 Historical Roncesvalles Village is a 2 minute walk away. Visit trendy restaurants, dynamite coffee shops, gift and music stores and small bars with great live music and craft beer! The well known High Park is minutes away and has a small zoo, huge playground, outdoor pool, large cafe and more. The lake front is a 10 minute walk south which has paved trails for biking, rollerblading, parks, beach, huge (free) outdoor pool, cafe, etc. My husband and I are both teachers and enjoy outdoor activities like boating, hiking and canoeing. We have two amazing daughters who keep us busy and laughing everyday. About a 15 minute train ride and you will be right in the heart of downtown Toronto. Steps away from trendy Roncesvalles Village, High Park and the lake front and only 20 minutes to downtown. About a 10 min walk and you will have access to walking, running, and biking trails all along the shore of Lake Ontario. As well as access to beaches, a huge public swimming pool and cafe. The eat-in kitchen has a small harvest table that can seat 6 comfortably. Our main floor living space is kid friendly and has lots of toys available for your little ones to play with. This family style home is open and welcoming with a gated front yard and porch complete with mini basketball net and sandbox. The back patio is perfect for dining outside with a large table and gas BBQ. Maison Très bien située, à quelques minutes du street car qui vous emmène au centre de Toronto. On peut faire les courses à pieds aussi. La Maison est très cosy et tout est prévu. Nous avons pu faire des barbecues dehors, les enfants sont allés à l'air de jeux juste derrière la maison en toute sécurité. Pas besoin de voiture, nous avons pris 2 pass pour la semaine et des tickets pour la grande ( transport gratuit jusqu'à 12 ans). On reviendra. Merci à Wendy pour ses conseils. Anne Cecile and Sebastian were excellent guests. The house was very clean after they left and they were excellent communicators before and during their stay. They are welcome back anytime! Very good location both by car and by public transport. The house is equipped with everything you need. Place was clean and ready for our arrival. Everything was easy to find and use. A quiet location in a big city. Wendy's home is exactly as described. It's not exactly a home for vacation, but you have everything you need. This home is old but everything is well organized and we didn't miss anything. Wendy's attention was good at all time. The house was very clean, although there were some personal belongings of the property in the closets. The only drawback is to park. It's easy to get a permit, but difficult to print for a foreigner. I would recommend it if you like to enjoy a real home. We LOVE our neighbourhood and we know you will too! Historical Roncesvalles Village is a 2 minute walk away. Visit trendy restaurants, dynamite coffee shops, gift and music stores and small bars with great live music and craft beer! The well known High Park is minutes away and has a small zoo, huge playground, outdoor pool, large cafe and more. The lake front is a 10 minute walk south which has paved trails for biking, rollerblading, parks, beach, huge (free) outdoor pool, cafe, etc. If you do not have a car, no worries! We are a 1-2 minute walk to 3 different streetcar routes. The 505 that goes along Dundas St. West, the 506 that goes straight to little Italy on College St and the 504 to King St which can take you right to the heart of the city. You can get to the Subway system within 5 minutes on any of the streetcars OR you can walk the 10 minutes directly to the station. You can be in the downtown core in 20 minutes by TTC. If you have a car, we are 2 minutes off of the Gardiner Expressway. Please come in and take your shoes off at the door. Absolutely no smoking, no pets or no parties/receptions allowed. Please be respectful of neighbours and the tenant downstairs.